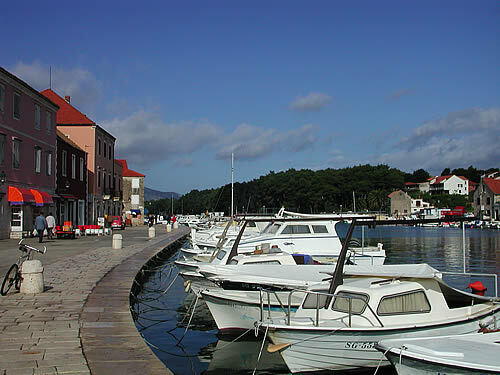 Stari Grad is an old town. If you wind back time by a couple of thousand years to the turn of the millenium, you’d find that settlements on the island consisted of Illyrian hillforts, mostly away from the coast, though the castle at Hvar town directly overlooked the harbour. And then there was Stari Grad, which by then was nearly 400 years old. So let’s step back a bit further, to 384 BC, which marks the official founding of this town. At this point, the Illyrians are in charge of the island, including the long inlet where Stari Grad now stands. Apparently they had a settlement there, with watch towers to the north and south. It didn’t do them any good, because Greek settlers from the island of Paros in the Aegean arrived and took it over. This was and is a great strategic location, with a safe harbour and access to the best agricultural land in the Adriatic islands. The Greeks called their new settlement Faros, and set about measuring out parcels of land for distribution to the colonists. Apparently they had to defend it quite vigorously, as the town had a wall not just to the seaward against pirates, but also on the landward side. Massive watchtowers at Maslinovik and Tor above the fields also kept guard. Following the Greek settlers, the Romans took over, and renamed the town Faria. It wasn’t a big centre for them, as their main settlement was on the mainland at Salona. With the arrival of the Slavs in the 8th century, the pronunciation and spelling changed slightly and the town (and the entire island) became known as Hvar. But wait, that’s not what we call Hvar town nowadays, is it? No, not yet. Moving on to the 13th century, the islanders petitioned for the protection of Venice, and as part of the arrangement, they committed to building a new port on the southern shore. For some time, people would refer to the two towns as “New Hvar” and “Old Hvar”. But as new Hvar grew in importance, the old town became a quiet backwater. Like all of the island’s coastal settlements, it suffered badly in the 16th century from a series of attacks by the Turks, most notably in 1571. 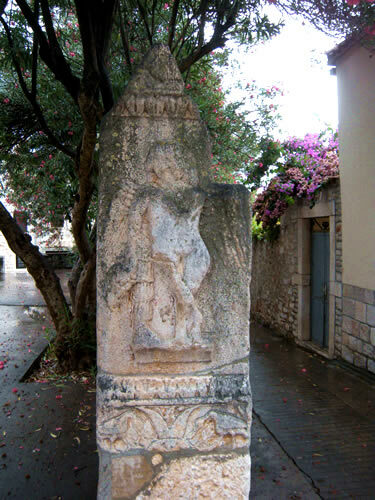 The old town became simply that – Stari Grad, a literal translation. So what can you see of all this antiquity as you walk around the town? As is usual with a continuously occupied town, it’s layer upon layer, with ancient bits and pieces appearing in newer structures. Old Greek foundations lie beneath the walls of the 5/6th century Christian church of St John. Roman inscriptions appear on blocks in the main belltower, and nearby there’s a very old relief carving next to the church of St Steven. 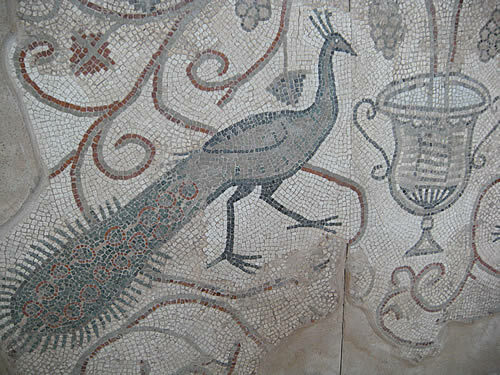 Mosaics can be seen inside St John’s church, and in the Stari Grad Museum at the Biankini Palace, which also has a collection of artifacts from the town’s past. 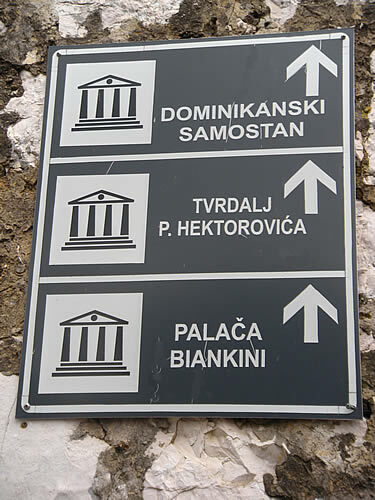 And up at the Dominican Monastery is a collection of stone carvings – though mostly reconstructions, it has to be said. For the originals, sadly, you need to go to the museum in Split. This is a lovely, very peaceful town to walk around. It’s very low key compared to Hvar town, but delightful in the small details you see as you wander the quiet streets. I want one for our house!